You are here: Home / Seasonal Events / Capital Color Ride – Oct. 6th – Family Friendly Biking with a Splash of Color! 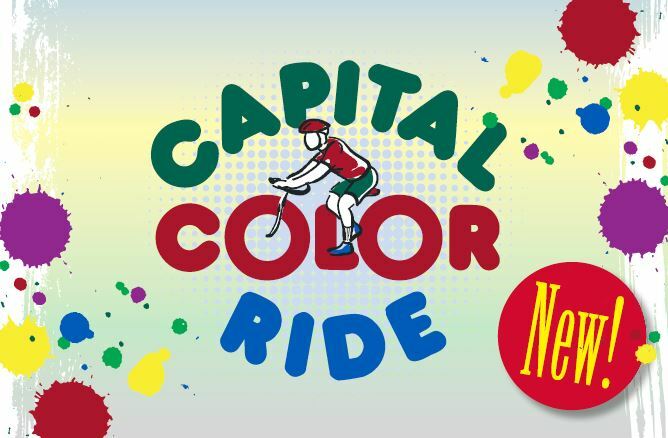 Capital Color Ride – Oct. 6th – Family Friendly Biking with a Splash of Color! You’ve heard of The Color Run™, but how about a color ride? Join Parks & Recreation on Saturday, Oct. 6, 9 a.m.- 1 p.m. for the Capital Color Ride and add a little color to your bike ride along a 15-mile stretch (choose your ride option) of the Virginia Capital Trail. Enjoy family friendly biking – pedal at your own pace from Chickahominy Riverfront Park to the James City County Marina and back. Wear a white T-shirt and get “colored” at pits stops along the way which feature refueling stations of water, healthy snacks and recreational fun. All ages are welcome; children must be with an adult. The registration fee is $10/person/onsite (ages 10+) and includes an event T-shirt, lunch, refreshments, maps and “color stops” activities. Children age 9 and younger are free. Preregister by Sept. 30 and pay only $5/person! Also participating onsite will be James City County Police Department officers who can register your bikes and offer free bike safety checks as well as a variety of biking and community vendors. Registration forms are available at the James City County Recreation Center, Abram Frink Jr. Community Center, Chickahominy Riverfront Park and the Freedom Park Interpretive Center. You can also register online or call 757-259-4200. Chickahominy Riverfront Park is located at 1350 John Tyler Highway. Weather permitting, in the event of inclement weather, please call the Activities hotline at 757-259-3232 for schedule updates.